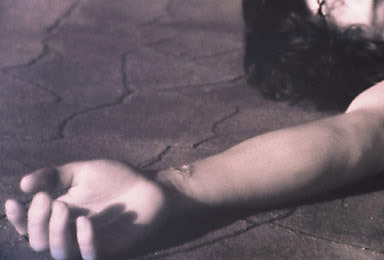 Jamie Clyde’s photographs have received rough treatment lately (see here). Her photographs, which were hanging for a time in the Angles Gallery in SLC, caused a little bit of a stir when their religious content was claimed to be offensive. When I saw Clyde’s works, after hearing of the controversy, I was surprised. The photographs are striking, even startling but I had a hard time seeing how they are offensive. 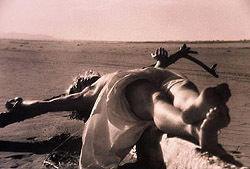 In these works, Clyde has shot images of a model portraying Christ, stretched on a large piece of driftwood or lying on an open stretch of sand near the Great Salt Lake. The Christ figure is bathed in a warm, caressing light. The works are quiet, but charged with a certain energy. Some of the compositions hark back to European religious painting, including Mantegna and Rubens. But offensive? These works are a far cry from a crucifix in a pitcher of urine. On the other hand, this is Utah. I can imagine three possibilities for whoever it was that invoked their constitutional right to be offended. None of the three are convincing. The first is that the Christ figures are inert. 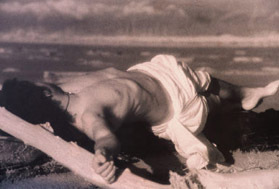 In Clyde’s works, Christ, or the cross he is stretched on, is lying in the sand. So, says the offended party, the commentary is that Christ or Christianity is powerless, inert. Not likely. A lifeless, prone Christ is nothing new for Christian art. 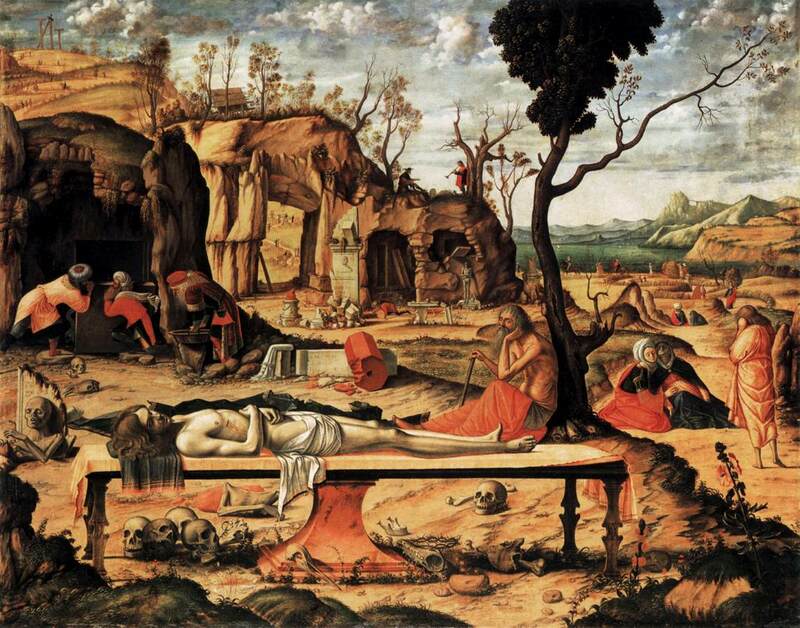 Gothic, Renaissance, and Baroque art are filled with examples of a lifeless Christ portrayed in religious painting. 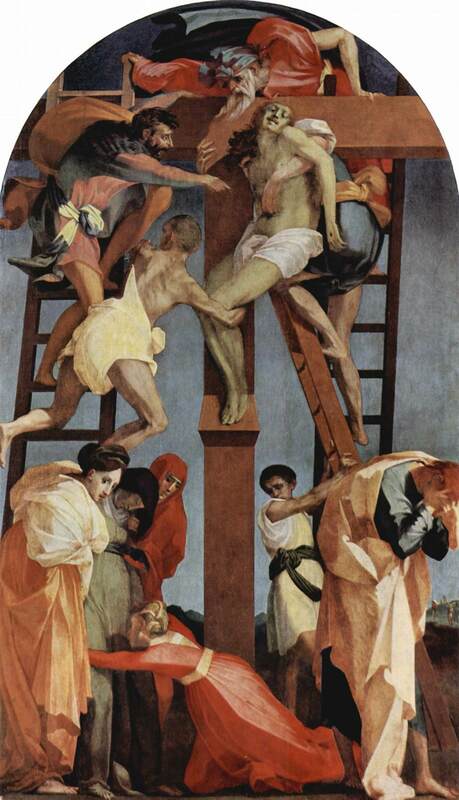 Some of the most beautiful Christian paintings are versions of “The Descent from the Cross” or Christ’s body being prepared for burial, all of which show an inert Christ, and even, in the case of Rosso Fiorentino, a green one. The difference between these examples and Clyde’s work, however, is that in the former the works are not so much about the Christ figure but about the human drama encircling the body — the sorrow of the mother Mary or of the disciple John. Clyde’s works are devoid of other human figures! the offended party contends. Not so fast. I am reminded of a painting by Carpaccio pointed out to me by a friend this Spring in Italy. In this work, Christ’s body, which takes up only about a fifth of the picture, has been laid out on a stone slab in front of the tomb. A variety of things are happening in the painting, but nothing or no one in the painting is directing their attention to the body of Christ. The body of Christ is being ignored, except by the viewer of the work. The lack of figures in Clyde’s work can be seen more as a commentary of how the figure of Christ has been forgotten or possibly as an invitation to the viewer to consider his or her own relationship to the figure of Christ. But nothing from the treatment, the lighting, the view points or other aspects of Clyde’s work shows it to be a derogatory comment on the Christ figure. Lastly, and this is what I imagine was the real complaint about Clyde’s works are the wounds. Clyde has prepared her model with very realistic wounds, something that might be disturbing to a delicate audience. This attention to the wounds of Christ is nothing new. The Mormon culture tends to stay aways from depictions of the cross or the sufferings of Christ – “to concentrate on his triumph. The Catholic and other Christian traditions, however, have always used the sufferings as a point of meditation. Matthias Grunewald’s gothic depiction of Christ on the cross is not pretty, but it is strongly Christian. To not hold to one specific Christian tradition’s aesthetic outlook does not make one non-Christian. And I think the wounds are crucial to these pieces. What is probably most startling about the wounds is their reality. To paint a wound is one thing. We know it is a fiction, a re-presentation. But to present the Christ figure in a photograph is to make the image startlingly real, strikingly present. Photographs tell us about our lives today. They are the medium through which we learn the news of sniper killings in Maryland or suicide bombers in Palestine. And to see Christ, with wounds and all, before us, in a photograph is unfamiliar and can be uncomfortable. But that is precisely what makes these works so exciting. In the modern mind, representations of Christ belong in art history books or else as impressionistic illustrations for religious manuals, but they rarely catch our eye. Repetition can dull the mind and desensitize us to real consideration. And so when Clyde presents the Christ figure in the realistic format of photography she shocks the viewer into considering. Which is what someone who walked into Angles Cafe must have done. Unfortunately, they may not have considered very well. We live in a very religious, predominantly Christian community. If an artist can take an icon of our community and make us reconsider it and ponder about it, then that artist has accomplished their job.